What Is Not-Com, and What Does It Mean for Business? Since 1999, countless companies have snapped up some of the best domain names with the usual suspects dot-com (.com) and dot-net (.net). This has forced some business to scramble for a consolation web address, which might look like a reasonable solution on paper but winds up being long, unwieldy, difficult to say or spell, and impossible to print on business cards. Luckily, where there used to be scarcity in online naming (as ridiculed by SNL), there are now more than 1,000 new choices available. Although dot-fart is still not a legitimate domain option, options such as dot-agency (.agency), dot-legal (.legal) and dot-media (.media) are. These new options alleviate the internet inventory stranglehold experienced by companies searching for the perfect website address only to find it’s already been taken. They’re not just a last resort, either—they’re a primary choice for businesses as large as Amazon and Google and as small as your local mom and pop catering company. Website owners are gravitating to not-com domains because they’re meaningful, memorable, searchable, and available. If Dillon/Edwards Investments were a real business today, they could claim DillonEdwards.investments. Much better than clownpenis.fart, right? Buried beneath the humor, SNL was way ahead of its time in thinking about alternatives to dot-com. Today, there are millions of businesses, brands, and individuals dropping their dot-com domain names in favor of more creative, descriptive domains. More than 25 million not-com domain names have been registered, and approximately 10,000 new ones are registered every day—one every 10 seconds. 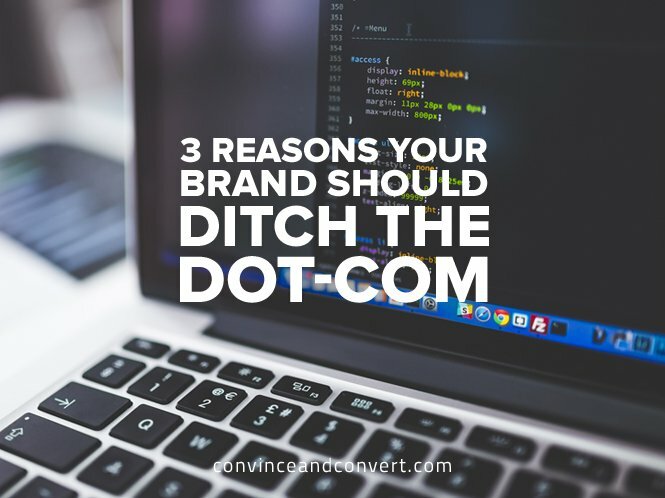 Even though there are some fun domain name extensions in the mix—dot-fail (.fail) and dot-wtf (.wtf)—most companies that drop dot-com are doing so in favor of names that better suit their business than a generic URL. This domain naming innovation, according to one branding expert, can put businesses at the top of the list when it comes to being memorable with prospective customers and clients. “If a phrase is easy to say and spell, it can be as memorable—or more memorable—than single-word names,” says Margaret Wolfson, founder and creative director at River + Wolf, a verbal and visual branding firm based in New York City. She adds that this applies to domain names as well, and recommends using the final word of the phrase in place of the dot-com (.com), when and if available. What If I Already Have a Domain Name That I Like? Even though there are a lot of great reasons to ditch your ho-hum domain name extension in favor of a more colorful choice that tells the world who you are and what you do, there are also a number of ways to use your not-com domain right alongside the site you’ve had for the last 10, 15, or 20 years. In addition to their widespread availability, here are some additional benefits to using a not-com domain name. Good domain names are succinct and descriptive, leaving little to the imagination about who you are and what your company does. When Atilla Vekony decided to take his 15 years of experience in online marketing and start his own digital marketing firm in 2015, he knew the domain name would be critical. He wanted something short, punchy, and memorable—something that would help him generate leads and lend itself to innovative branding. Vekony knew that a dot-com (.com) URL wasn’t for him, as available options such as icondigitalsolutionsaz.com or iconmarketingarizona.com didn’t capture what he wanted. Instead, he chose this succinct URL: icon.digital. That tells us a lot more about his business—a digital marketing firm—in a lot fewer characters, and I bet it looks much snappier on his business card, too. Meaningful names, by nature of being unique and descriptive, are much easier for a potential client or customer to remember. These days, your domain name is your digital calling card, and you only have one chance to make an impression. Look at these domains: soul.camp, driftaway.coffee, reno.florist, zest.marketing. They all roll right off the tongue and would be nearly impossible to misspell if you’re telling someone how to visit you online. Google also happens to be a proponent of not-com domain options, having gone on the record saying that businesses and brands needn’t worry about these new domains being treated any differently than dot-com (.com) and dot-org (.org) and the likes. In fact, a keyword-rich domain name that describes who you are and what you do may increase your chances of being found. But I Still Like My Domain Name! Alongside businesses that are grabbing up not-com domain names to use in place of dot-com or dot-net are brands that have creative ideas for their domain names. Amazon is a great example of a company that is riding the “not-com” wave in a big way. Its homepage remains amazon.com, but if you type in amazon.watch, amazon.football, amazon.shoes, amazon.clothing, and so on into your browser, you’ll be redirected to the according Amazon page. It’s SEO genius. Other brands have followed suit, such as high-end shoe retailer Jimmy Choo with its choo.boutique and Calvin Klein with calvinklein.shopping. Companies, including Amazon, are also launching websites for promotional marketing purposes on their not-com domain names. Amazon uses aws.training for its Amazon Web Services training and education programming, while Pedigree and Cesar’s launched their collaboration earlier this year on Mixmania.dog. Under Armour uses FastTwitch.training for its private label fitness coaching program, and countless others have made use of domain name extensions like dot-life (.life), dot-today (.today), and hundreds more to carve out a digital niche. Could a not-com domain name be perfect for your business? Follow Name.Kitchen on Facebook and Twitter for more inspiring not-com business stories. Maris Callahan is the director of public relations for Donuts Inc. and name.kitchen, where she spends her days doing media relations, content marketing, and social media. She lives in Chicago with Brad, her significant other, and their chihuahua Henry, her other significant other.